Bernheim & Schwartz is a new beer hall near Columbia University. The 250-seat space offers 10 brews from Greenpoint Beer Works and beer-friendly snacks like bacon mac ‘n’ cheese. Bernheim & Schwartz, 2911 Broadway, New York, NY 10025, 212-335-2911. Chef Floyd Cardoz, late of Tabla and North End Grill, has opened White Street. Along with partners Dan Abrams and Dave Zinczenko, Cardoz will oversee a restaurant serving up American fare with global influences. White Street, 221 W. Broadway, New York, NY 10013, 212-944-8378. BTH (By The Hudson) in Harlem serves Nouveau American fare and offers views of the Hudson River. BTH, 712 W. 125th St., New York, NY 10027, 212-222-2841. Sarah Simmons, of City Grit fame, has launched Birds & Bubbles, a Lower East Side eatery that pairs --- you guessed it --- chicken with sparkling wine. One of the signature dishes is Winner Winner Chicken Dinner, a whole fried chicken, a bread basket of biscuits and cornbread, and a selection of sides. Birds & Bubbles, 100 Forsyth St., Ste. B, New York, NY 10002, 646-368-9240. The new Charlie Palmer Steak, which has other locations in Reno, Las Vegas and Washington, D.C., offers 11 steak options. The chef is Matthew Zappoli. Charlie Palmer Steak, 3 E. 54th St., New York, NY 10022, 646-559-8440. Nick Anderer, the chef at Danny Meyer's Maialino, has opened Marta, a Roman-style pizzeria in the NoMad neighborhood. The restaurant looks to chip away at the Neapolitan pie hegemony that has taken over the New York pizza landscape in the last few years. Marta, 29 E. 29th St., New York, NY 10016, 212-651-3800. The Aldo Sohm Wine Bar, overseen by personable and knowledgeable Le Bernardin sommelier Aldo Sohm, is now open. On the menu: 200+ bottles, small plates, plus beer and spirits. Aldo Sohm Wine Bar, The AXA Equitable Building, 151 W. 51st St., New York, NY 10019, 212-554-1143. Perbacco, the once cutting-edge Italian restaurant in the East Village, shut down after losing its chef. The restaurant is reopening with Roman toque Clelia Bendandi. Perbacco 2.0 emphasizes Italian wine, with up to three dozen available by the glass. The menu focuses on small and shareable plates. Perbacco, 234 E. 4th St., New York, NY 10009, 212-253-2038. From the people who brought you Smorgasburg and Brooklyn Flea comes the new Berg'n, a beer hall with some seriously good food options in Crown Heights. Ramen Burger, Asia Dog, Pizza Moto and Mighty Quinn's are all set up inside the beer hall. Berg'n, 899 Bergen St., Brooklyn, NY 11238, 718-857-2337. Grand Banks, the docked-boat-turned-ultra-hot-restaurant, has set October 31 as the date that it will shut down for the season. And to celebrate it is offering a happy hour from October 1 to 31: oysters from Long Island and its surroundings will be $1 from 4 p.m. to 6 p.m. Monday to Thursday. For the month, the restaurant is adding seafood-laced chowder and hot toddies to the menu. Grand Banks, Pier 25, New York, NY 10013, 212-960-3390. Danny Meyer Eyeing Bryant Park? According to a liquor license application, Danny Meyer may be eyeing the new glass tower at 7 Bryant Park (1045 Sixth Ave.) for his next restaurant. Stay tuned. Chef Anne-Sophie Pic is bringing her Parisian eatery, La Dame de Pic, to New York City. The restaurant will actually be two in one: on the ground floor will be Metcafé, an outpost of her Monaco establishment, and on the second floor will be La Dame de Pic. The chef's eponymous restaurant, Pic, in Valance, France, earned an 18 rating from GAYOT. La Dame de Pic & Metcafé, 510 Madison Ave., New York, NY 10022, no phone. It appears Mission Chinese Food, once anchored on the Lower East Side and then resigned to pop-up status, has a new permanent home. Chef Danny Bowien's hot restaurant will take up residence in the space that recently housed now-shuttered Rosette. The restaurant should be up and running sometime this autumn. Mission Chinese Food, 171 E. Broadway, New York, NY 10002, no phone. Enrique Olvera, the acclaimed chef behind Mexico City's Pujol, is set to open Cosme, a restaurant in New York City's Flatiron District. Expect to encounter unlikely items like Mexican clam chowder. There will also be homemade tortillas and, of course, classic margaritas. Cosme, 35 E. 21st St., New York, NY 10010, no phone. 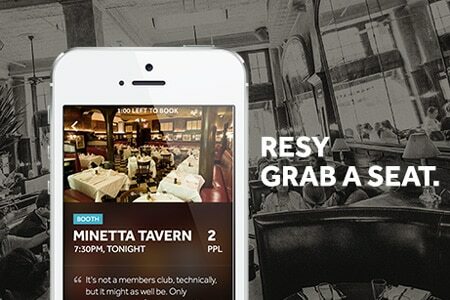 Eater co-founder Ben Leventhal has introduced RESY, a mobile app that allows diners access to last-minute tables at in-demand restaurants. Some reservations require a fee, while others can be made with no charge. RESY has partnered with 30 New York restaurants, including Bar Bolonat, Aldea and El Toro Blanco, with plans to increase that number to 200 in the near future. “Next we’re looking to expand to Los Angeles and also launch a desktop version,” Leventhal told GAYOT. RESY is available for download on the iPhone and Android. For more information, visit resy.com or watch the YouTube videos Resy Concept: PopQuiz or Resy Concept: Email for more explanation. Le Bernardin has unveiled an additional private dining space called Le Bernardin Privé. For more information, visit www.le-bernardinprive.com. 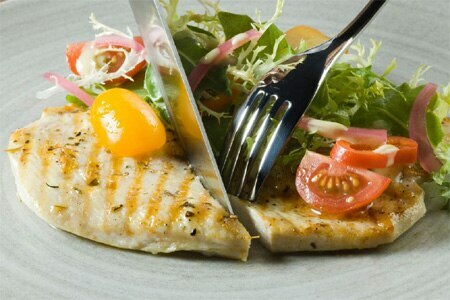 Le Bernardin, The AXA Equitable Building, 155 W. 51st St., New York, NY 10019, 212-554-1515. Brooklyn's The Elm is celebrating its first birthday in September by offering guests who sit down for a meal at brunch or dinner a complimentary signature cocktail. Just say the word "ELMBDAY" to your server or when you book your table. The Elm, McCarren Hotel & Pool, 160 N. 12th St., Brooklyn, NY 11249, 718-218-1088. Black Seed Bagels, that über-popular Montreal bagel shop in NoLIta, will be making bagels late into the night now on several evenings. It will be open Thursday to Saturday from 10 p m. to 4 a.m. Black Seed Bagels, 170 Elizabeth St., New York, NY 10012, 212-730-1950. The Madison Square location of A Voce has a new happy hour that should make cocktail lovers very happy. From 4 p.m. to 7 p.m. Monday to Friday, cocktails, Prosecco and Peroni beers are $7. A Voce, 41 Madison Ave., New York, NY 10010, 212-545-8555. Sam Hazen, once the chef at now defunct Veritas, has a new gig. He's the culinary director overseeing the BR Guest restaurant group’s seafood-centric restaurants: Atlantic Grill, Ocean Grill and Blue Fin. Atlantic Grill, 1341 Third Ave., New York, NY 10021, 212-988-9200. Tavern on the Green's revival has hit a speed bump. Chef Katy Sparks has left the restaurant. A replacement has not yet been named. Tavern on the Green, Central Park W., New York, NY 10023, 212-877-8684. Angela Pinkerton, the pastry chef at Eleven Madison Park and an eight-year veteran of the acclaimed restaurant, is leaving her post to seek cooking opportunities in the San Francisco Bay Area. There's no word yet on her replacement. Eleven Madison Park, 11 Madison Ave., New York, NY 10010, 212-889-0905. Charlemagne, the underappreciated French restaurant in the West Village that was open for nary a year, has closed. Charlemagne, 679 Greenwich St., New York, NY 10014, no phone. Health-conscious restaurant Gobo has shut down. This West Village outpost as well as the Upper East Side location (on Third Avenue) have both closed. Gobo, 401 Sixth Ave., New York, NY 10014, no phone. Haru, the Upper East Side sushi spot, has shut down for renovation. The restaurant will reopen toward the end of 2014 with a new interior design and a full cocktail bar. The downtown Manhattan location of Haru remains open. Haru, 1329 Third Ave., New York, NY 10021, 212-452-2230. Due to a rent increase, the Upper West Side location of seafood-leaning Ditch Plains has shut down. The West Village outpost of Ditch Plains remains open. Ditch Plains, 100 W. 82nd St., New York, NY 10024, no phone. Andy Ricker has closed his closet-size Pok Pok Phat Thai eatery on the Lower East Side. He will reopen it soon in Red Hook, Brooklyn, closer to his other two restaurants, Pok Pok Ny and Whiskey Soda Lounge NY. Pok Pok Phat Thai, 137 Rivington St., New York, NY 10002, no phone.